When it comes to the world of pasta many people know very little about the different varieties. Though many of us enjoy relishing pasta layered with mouth-watering sauces, many of us are unaware of the perfect pasta and sauce combination. Choosing the right pasta shape with a sauce can make a lot of difference to the final dish. The different shapes of pastas absorb the sauce differently, thereby affecting the taste of the dish. All shapes of pastas don’t work with complex sauces which makes it important to choose the combination of sauce and shape. Stuffed pastas, for instance, have a simple broth whereas tiny shapes are generally used in soups. The thumb rule is light, thin and liquid sauces are best suited for thin or filled pasta, which are stuffed with gently-flavoured ingredients. Heavy sauces, which are more concentrated, rich or spicy are best served with thicker pastas as the ridges of the pasta absorb more sauce. Read our blog to find out some of the favourite pasta and sauce pairings that you can try out in your kitchen. Coming from Italian word “pens”, penne pastas are small cylindrical-shaped pastas cut at an angle. Similar to other ribbed tube-shaped pastas, penne pasta goes well with thick sauces. 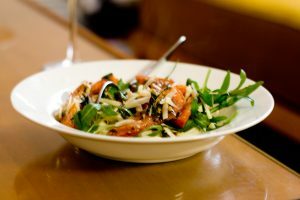 Olive oil-or butter-based vegetable or tomato sauce, cream-based concoctions blend well with Thick sauces sneak into the tube shape of the pasta giving it a juicy and delightful taste. Penne pastas also blend better with a generous serving of cheese. Commonly known as bow ties, Farfalle, which means butterfly, is a favourite among children. Short shaped pastas such as farfalle taste great with rich sauces, especially if the sauces have bits of vegetables or meat. The large and smooth surface of the pasta blends well with cream-based sauces. Considered world’s most popular pasta, spaghetti is a staple in Italian restaurants. Spaghettis are best served with light sauces such as tomato, garlic or olive oil. The light sauces coat each strand of the spaghetti evenly making the pasta flavourful. The light sauces also ensure that the pasta can be easily wound up with a fork. To add some twist, you can also add some small and light additions such as fresh herbs, or tomatoes. A short pasta with twisted surface, Fusilli is short-shaped pastas. The pastas are served best with light and smoother sauces that have bit of meat or vegetables. The spiral shape holds on to the rich, and hearty sauces. The pasta has been specially designed to hold on to the cheese, ricotta sauces or pestos. If you prefer preparing salads, you can opt for tri-colour pastas to make the salad colourful and vibrant. You can use different types of sauces depending on the type of shell pasta you plan to cook. If you are using large shell pastas, you can stuff and bake them. You can also stuff the large shells with cheese and different types of sauces. Medium-sized shell pastas blend well with thick sauces. The small sized shells are best paired with soups and stews. A thicker variant of pasta, Fettuccine is a flat, ribbon-like pasta. 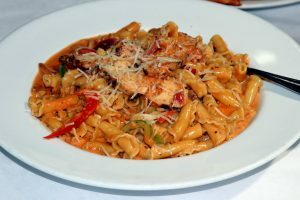 The variant of pasta is best suited with rich, thick and creamy sauces. The flat shape of the pasta makes it ideal to be paired with thick sauces. Linguine is in-between narrow spaghetti and wide, flat fettuccine. The thin, flat noodles go well with thick and rich sauces as the flat surface of the noodles can soak up all the delicious juices of the simple and creamy sauces such as Alfredo. The thinnest and finest type of pasta, angle hair has long and very fine strands that are easy to cook. The narrow noodles blend well with delicate sauces such as broth, tomato sauce. 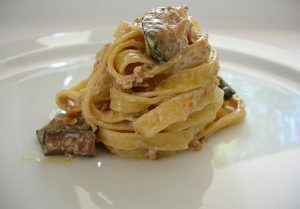 You can also cook the variant of pasta simply with butter and oil. 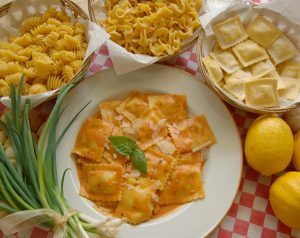 A unique variant, Ravioli is a square shaped stuffed pasta that is made with two sheets of fresh pasta filled with delicious stuffing. As ravioli can be filled with different types of ingredients such as cheese and vegetables. Butter or cream based sauces, tomato sauce, or even broth can be used with ravioli as it doesn’t overwhelm the taste of the pasta. 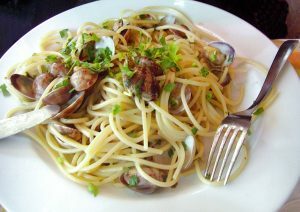 A well-known long tube pasta, buccatini has a straw-like shape and resembles thick spaghetti. The hollow centre and thicker texture of the Buccatini makes it ideal to be paired with strong flavoured and fluid sauces which can fill the centre of the pasta to give it a delicious and juicy taste. When cooking a pasta, you need to consider a number of factors such as the variance in cut, shape and thickness. The form and texture of the pasta plays a major role in deciding the type of sauce that will enhance its taste. You can also make pasta from the scratch if you are health conscious and prefer healthy alternatives. All you need is the KENT Noodle and Pasta Maker which helps customize the ingredients to enjoy healthy and tasty pasta. 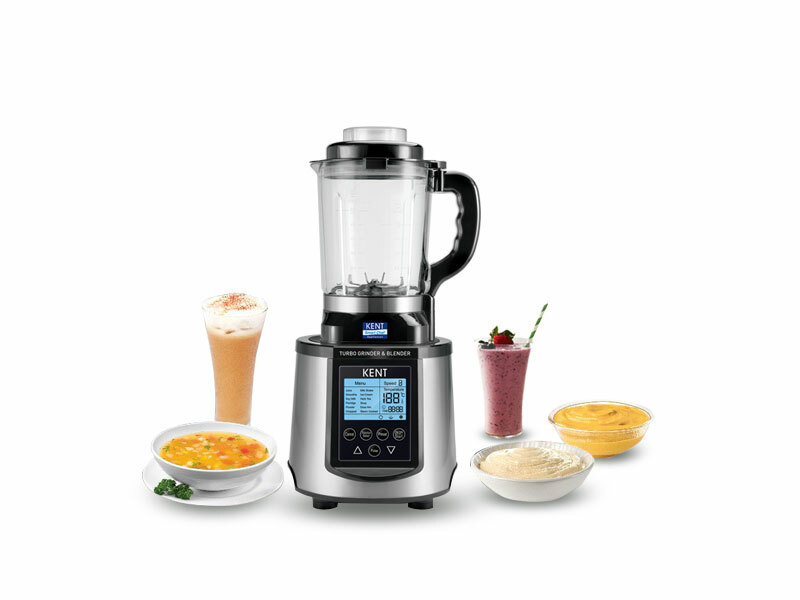 To request a free demo of the KENT Noodle and Pasta Maker, click here.